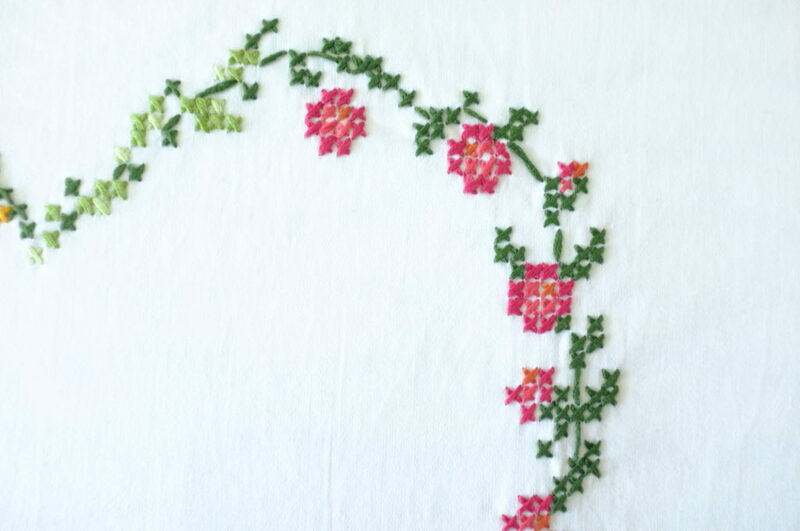 While sewing is my favourite pastime, I love all types of crafting. So when my friends were thinking about how to personalise some bed linen as a wedding present I jumped at the chance to try my hand at some embroidery. While I’ve done embroidery occasionally (my last project, my brother’s birthday shirt) I never tackled a big embroidery project. So this was the perfect opportunity. I knew I wanted to keep it relatively traditional, to give it a trousseau feel. While brainstorming with a friend, we realised that the initials of the bride and groom (a C and a G) could be combined in a symbol of two intertwined wedding rings together with the family name and the date of the wedding. 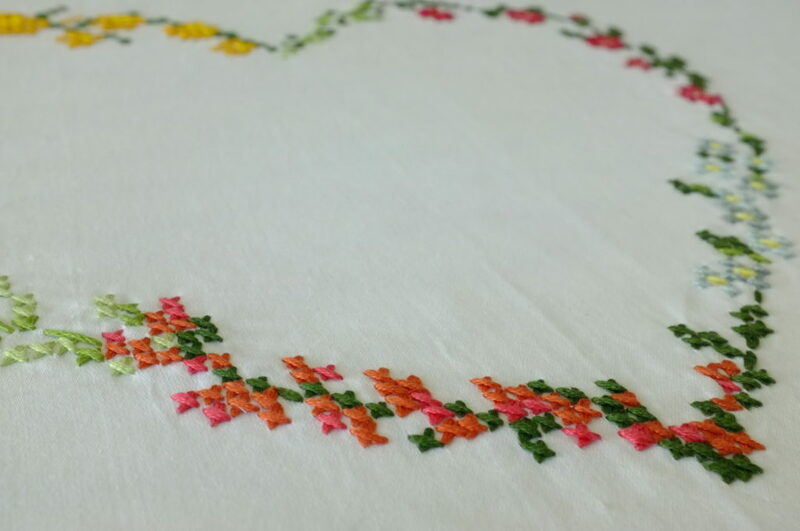 Around this symbol I wanted to cross-stitch a flower heart. 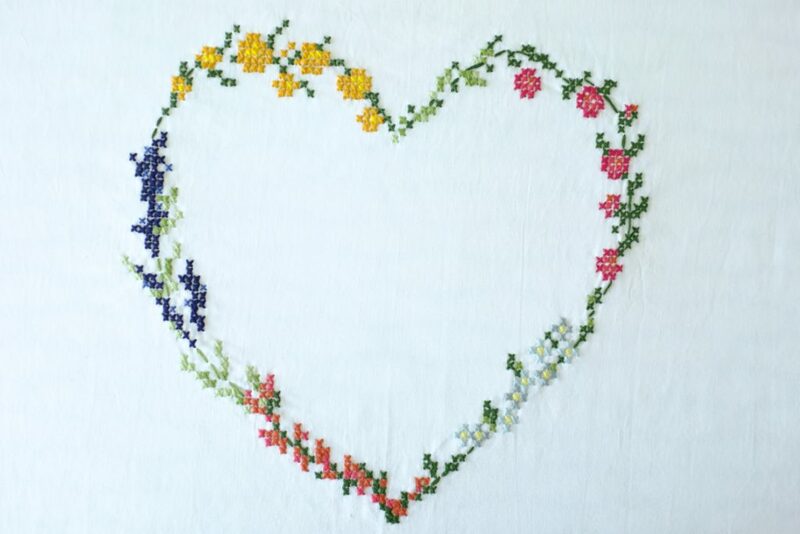 After some searching on Pinterest I settled on a pattern of a heart of different coloured flowers, which I found here (this blog has a lot of gorgeous patterns). To stabilise the fabric, I ironed on some light weight interfacing to the back . 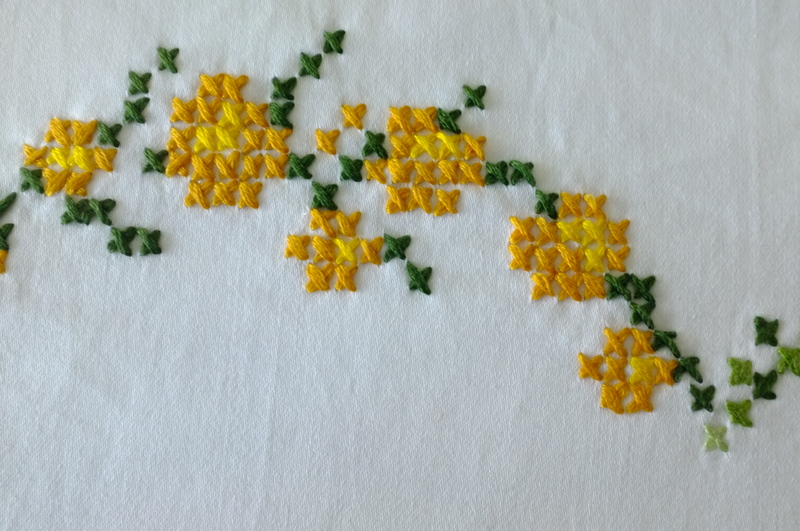 I transferred the pattern to some millimetre paper and decided to just keep it on top and stitch through it. This worked well and was actually really fun. I loved seeing the colours come together. The only issue was that the oversized bed linen was a lot of fabric to handle. Also it was white and I was afraid to get it dirty. As the embroidery was at the open end of the duvet cover, it was easy to access and I decided to put the rest of the cover in a fabric tote to keep it clean and out of the way. Once I was done I tied all the ends (the back looked pretty messy with all the different colours) and carefully removed the paper with some tweezers. This was quite tricky at times, because I had printed the millimetre grid on some normal printer paper, which was probably to thick for the purpose, but it worked out alright. 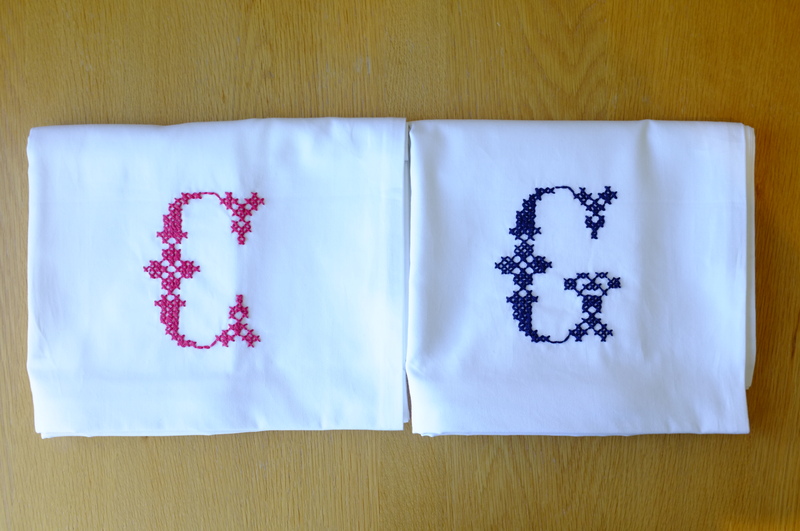 For the two pillow cases I went with the initials again in a simple cross-stitch pattern. I found one where the G and the C were both based on the same base shape. The whole alphabet is available here. I omitted the squiggles (is that actually a word?) 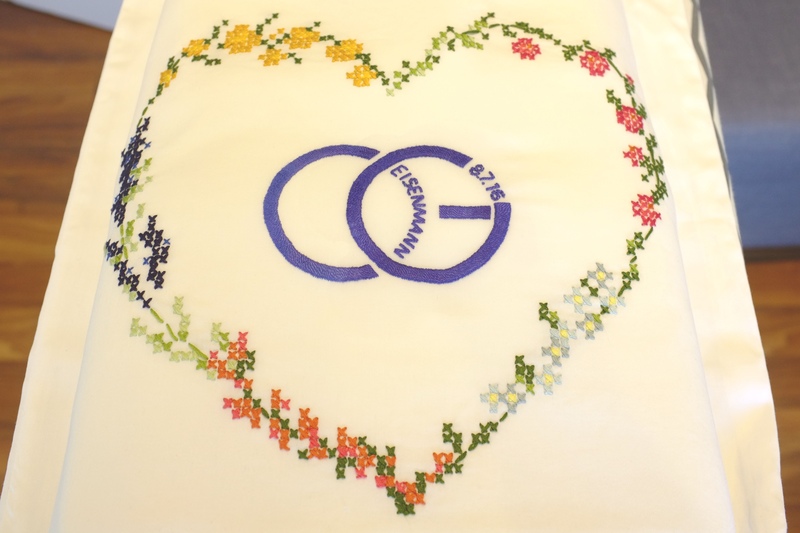 and embroidered them the same way as I had the flower heart. Finally I moved on to the trickiest bit, the wedding ring logo. I wanted it to look neat, and clearly to read. This time I decided to transfer the shape with a washable trick marker directly onto the fabric. 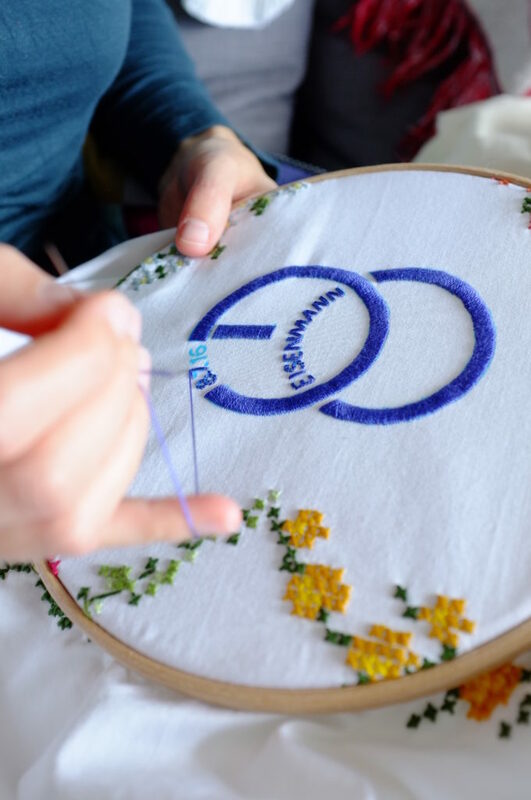 With a thinner blue embroidery thread and enough patience I filled in the shape. When I was done I erased the markings the best I could with some water. For some reason the blue colour always reappeared in a different place again. I could probably have avoided that by putting the linen in the wash but I really didn’t want to wash, dry and iron the thing. I love how it all turned out. I probably spent around 10 hours on it, but I didn’t mind doing it at all (finally a perfect excuse to binge-watch Velvet). I like how meditative the repetitiveness of embroidery is. And it sure does give a plain set of bed linen a lovely personal touch. I’m already scheming what I could embroider next. Maybe some bold florals on a summer top?